China's agricultural users more rational now, more favored good reputation, advanced technology, stable performance, high-end products and good service .We current supply and booming situation, it continued to benefit from the business in recent years to improve the technology, quality , marketing, management aspects . Since last year, a drag accelerate the " poly -core cast strong" strategy, farm tractor quality continued to improve , a large number of advanced production equipment , but also enable enterprises to continuously improve the level of manufacturing , assembly, quality has been effectively guaranteed. 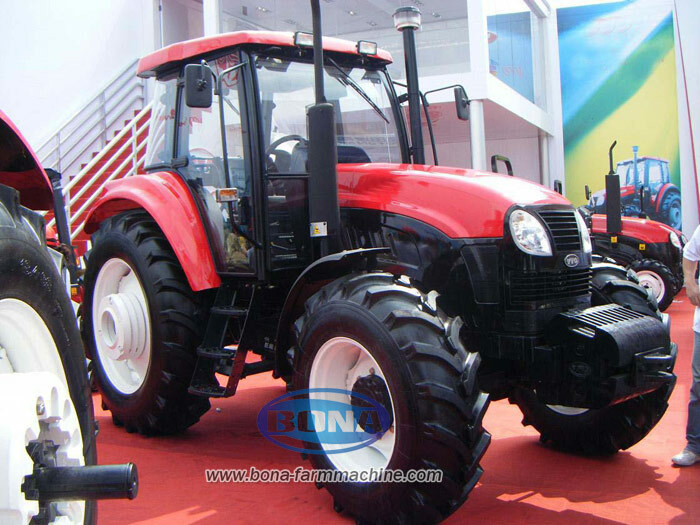 Meanwhile enterprises to increase technology investment,optimize marketing strategies , strengthen service support, accelerate structural adjustment , has introduced high-end products for the market demand, it is these fruitful work , so the market competitiveness of the tractor further improved. Industry data show that this year , the market performance of the product is superior Bona tractor other companies in the industry . Even in the small wheel tractor in the field , farm tractor-HP series(eg.125HP farm tractor)of high-end small wheel tractor product sales also hit record highs , become relatively small downturn dragged the market a rare bright . Now, see the loading , shipping and busy scene in a trailer inside the plant . It is understood that a recent trailer shipped thousands of daily Bona farm tractor,farm tractors made in china. To ensure the smooth implementation of the plan of each unit of production , a trailer units and functional departments are the host unit as a leader, to establish security for the mechanism. Bona purchasing department to sort out parts suppliers , and requires suppliers to raise security for its guarantee commitments for capacity. During the high-yield, not only to ensure supply , do not "hungry " , it should also take good quality. Bona also sent a quality inspection team composed of engineers to focus on the quality of the supplier's production site for checks. In order to eliminate the diesel farm tractor "three missing ", the relevant departments of the tubing Parts for special promotion, organize staff training , to prevent failure due to the oil spill caused by improper operation . At the same time , strengthen the supervision on key suppliers , technology sector through technical means to strengthen the protection of the tubing Parts , improve seismic, crack resistance , and big wheel tractor models for the pilot to drive improved low-pressure pipe tubing . Shipping sector is also actively taking measures to avoid the bump caused during transportation pipeline fault .